Carova Beach is a community in the northern Outer Banks accessible only by 4×4 since it’s well off the “paved roads,” and here is where you will find some of the most beautiful rental vacation homes and breathtaking ocean views. This area of Currituck’s Outer Banks has been named as one of the most secluded beaches in America several times and is where the legendary Corolla wild horses have roamed free for centuries. If you have longed for a relaxing vacation that requires no set itineraries or driving all over the place to enjoy yourself, Carova Beach is waiting for you. Get the extended family together for a week-long stay at any of the luxury beach homes – there’s room for everybody and you’ll love amenities like hot tubs, swimming pools, and huge decks for barbecuing and outdoor dining. If you’re lucky, you can sit on the deck and see Currituck’s famous wild Mustangs trotting along the shoreline. The wild horses are a big draw in the OBX, so don’t forget your camera. Where else on the East Coast can you soak up the sun, reconnect with family, and see majestic horses playing in the surf? 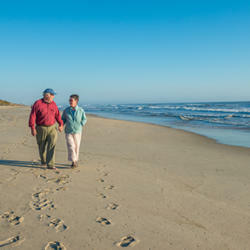 A vacation in Carova Beach is your chance to unwind and recharge. There aren’t many places on the Eastern seaboard where you can embrace a sense of isolation yet still have access to great restaurants and ice cream shops and fun activities. In nearby Corolla you can rent a kayak and explore the Currituck Sound, take kiteboarding and hang gliding lessons, and hop on a fishing charter. After a day on the beach, watch the sunset from your vacation home and share the memories with your family. Explore our site for more information on creating your dream beach vacation. Get Your Free Visitors Guides!